Plant in Pots and protect with copper wire sharp material around plants. I hope this works for you but still do keep an eye out for the slimy little buggers because I’ve had them crawl up 3 shelves to the top and plant their little bodies in a pot in my greenhouse! My top shelf is probably 4 1/2 feet high. They are very persistant!!! 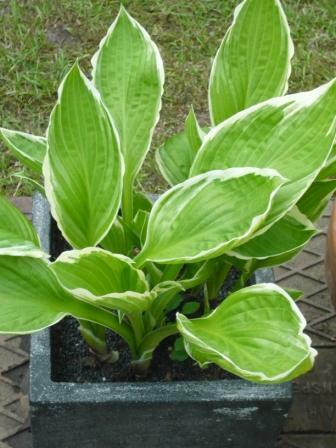 I certainly don’t mean to sound discouraging but don’t want you to lose more hostas – I’ve almost lost some too. Yup, I’m thinking plastic hostas would for sure be unpalatable to those pesky slugs, but also to the gardener, so I sure hope those slugs don’t find your potted hostas! I had problems with slugs for years, learned a tip that has worked great for me. After a rain or a good watering when those little buggers like to come out, I give my kids squirt bottles filled with a mixture of half amonia and half water and let them spray the dickens out of my hostas. The slugs die, the plants are fed and everyone is happy! As gruesome as it is, chopping the little ones in half seems to stunt the population in my garden… that’s if the frogs don’t get to them first! Wool pellets also seem to be effective, if a tad messy – wet felt mat around the plants…hmmm! Time to consider the plastic option perhaps? !… Haha! The 50/50 half water/half ammonia trick kills them on the spot and won’t hurt your Hosta leaves unless you completely saturate it. Then it just bleaches it out a little. No harm to the actual plant. 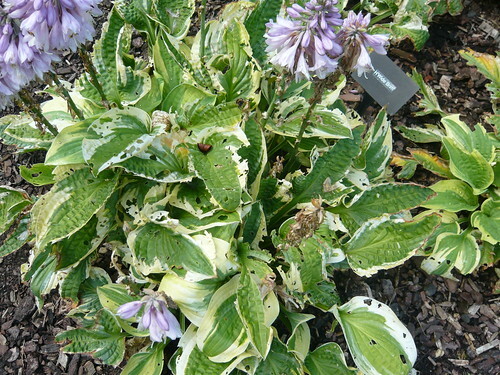 Ammonia gives your Hosta a shot of Nitrogen. Another handy trick is to use 1 part ammonia to 9 parts water and starting in the spring, pour it around your hosta plants, right when they start peeking out of the ground. This will help to kill the thousands of slug eggs and babies. I was told that this can be done every couple of weeks, but to make sure to do it in the fall.